Native Instruments Maschine Jam - "A perfect complement to maschine studio"
Livid Instruments Base II - "Good, but not for Reason." Ableton Push 2 - "Great, almost perfect ergonomics"
Korg nanoPAD2 - "Not so good velocity pads, great XY pad!" 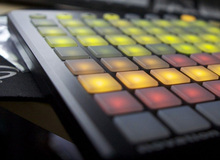 Novation Launchpad S - "Great product, with a few limitations"
Akai MPC Renaissance - "Akai headed to the future"
Ableton Push - "Best pad controller for Ableton"
Akai MPC Studio - "Great, but no interface"
Akai MPC Renaissance - "Best MPC out"
Korg PadKONTROL - "Quality pads"